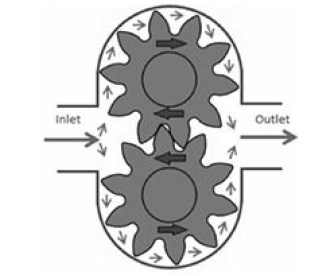 Positive displacement pumps (see Figures 1 and 2), unlike centrifugal pumps, theoretically can produce the same flow at a given speed (RPM) regardless of the discharge pressure. Thus, positive displacement pumps are constant flow machines. However, a slight increase in internal leakage as the pressure increases prevents a truly constant flow rate. As the pump is turned faster, more liquid is ejected from the pump. There are only two ways to increase output where a positive displacement pump is used—turn it faster or buy a bigger pump. In this type of pump, flow on the discharge side of the pump must never be stopped because discharge pressure will continue to build until something is damaged. There are many types of positive displacement pumps, but regardless of how a particular unit is configured, the results are the same. As the pump turns, the liquid inside it is trapped and must have a place to go. Positive displacement pumps have the same size inlet and outlet. On many of these pumps the suction and discharge can be changed by turning the pump in the opposite direction. Without a functional relief device on the discharge of the pump, catastrophic damage could occur. Positive displacement pumps also have performance curves (see Figure 3 above), but they tend to look quite different than centrifugal pump curves. If the discharge pressure is rising, the required horsepower is also rising. If the pump is required to deliver more flow (e.g.—gallons per minute, barrels per day, etc. ), then the speed of the pump must be increased or a larger pump is required. If the viscosity of the fluid is increasing, then the horsepower required to pump the fluid is also increasing. If the pump flow is increasing, then the net positive suction head required to prevent cavitation must also increase. These basic relationships can help to troubleshoot a problematic positive displacement pump. When you detect a pump problem and decide to act, always list the symptom or symptoms that were noted on the work request, such as ‘not enough pressure or flow’, ‘the outboard seal is not sealing’, ‘there is high vibration on the pump’, etc. Allow maintenance to evaluate the situation and determine the proper course of action.